My name is Arnfinn, from Norway. Been driving jimny for a couple of years, SJ413 since 1996. SJ was lifted 31" tires, but rust killed it .. (or my neglect i guess) building new SJ but will take some years. 2004 rear seat that folds down properly. Wondering if I should buy the auto transfer i've come across, or pursue other solution. Clutch is kind of smelly when driving over local mountain passes and steep hills. Poor low gear when offroading. Many others say auto transfer on 2005 jimny will be too low, but will it really with 235 tires? Was not going to fit larger tires now. My wife will not let me cut the arches yet..
Or should i rather convert to 1.6 engine? 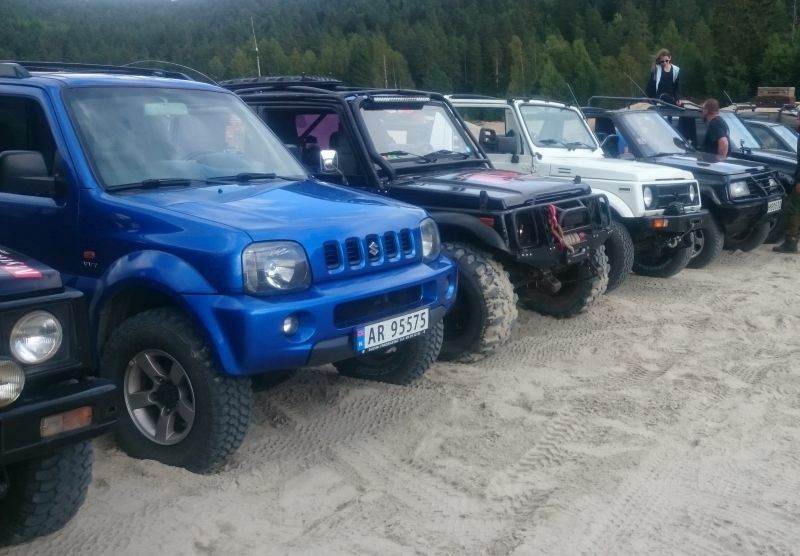 I drive 500-600km once a year to annual suzuki offroad meet, otherwise only small distances. Just cut the arches late one night and tell the wife it's been vandalised! Welcome to the club mate. I would like to see some pictures. That's of the Jimny not You! Fit a t-box from an automatic (as you mentioned). This will reduce gearing significantly and if you search on the forum for posts from a member called 'nicos' he has done exactly that and found 31" tyres were needed for some sanity at normal road speeds. 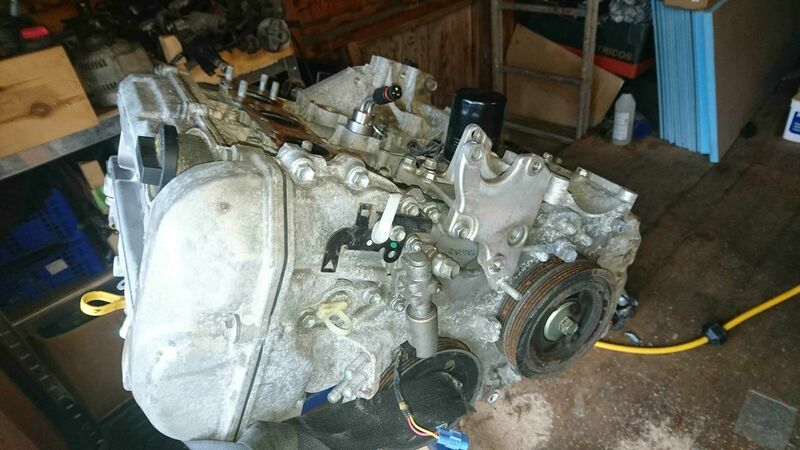 Change the transfer box and gearbox to that from an earlier (pre 2005) jimny. This would be an R7me gearbox, rather than the known problematic R72 gearbox you (probably) have. Some modifications with the shifter linkage required, hole in floor and gaiter required for t-box (is already a hole there, just has a plate under the carpet to unscrew). wiring alterations at t-box connections to keep vac hubs working and stop fault lights on dash (easy). This results in probably about the correct drop in ratios to suit your current tyres, and convieniently allows changing the t-box to a 'rocklobster' box, should you go to 31" tyres. It is possible to fit a earlier manual t-box straight in with the R72 gearbox, but you will need to mess around having a prop custom made for the gearbox output, as the push-botton box uses a longer prop from the gearbox and has different spline count on gearbox output shaft. 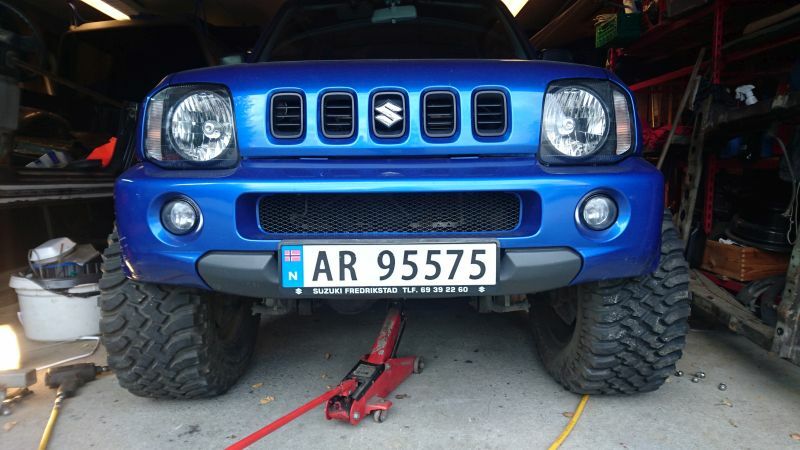 Next option is to look at changing the diffs to that from a pre 2004 jimny (option i am thinking about doing). The post 2005 have a diff ratio a fair bit higher than the earlier models. a forum search will show what the differences are. This is probably the cheapest and easiest way to solve it, but wouldn't allow 31" tyres without further mods. finally, as you say - MORE POWER! but this brings other issues such as increased wear on drivetrain/clutch/brakes, etc. Auto transfer and an M16A......I have the M16 and am considering the jimnybits 60% low range planetary....bit spendy but I've been good! Don't forget to post pictures....and thanks for the Christmas trees! Not a new picture, but more or less how the car is today. picture from Suzuki meet summer 2015. Note the jack. No air in the tires. Otherwise the wheels would get stuck in the arches. 325-60-15 BFG was in use on my SJ. Not going there on the jimny. yet.. Thanks for all replies. Yes, i got the VVT model with the transfer box with wrong ratios. Diff-change would give worse crawl ratio as i have the 4.3 today but combined with auto transfer could work for road use. Could stick an ARB in the rear when the diff is out though.. I have got a rock lobster SJ transfer box lying around and parts in stock for a couple more. but all the brackets and driveshaft and electrical "to do-list" on that modification is probably a bit too much.. Trying not to spend too much time or parts modding the Jimny as the SJ project is my main project. Auto transfer will cost about 400£ and M16 about 500£ and both those jobs is more or less bolt-on. If i get the M16 i guess i will not need the auto tranfser for road use as increased power will make my current setup ok..? If i do the auto transfer job as you say nicos and others say that it is too much. Does anybody now if it is possible to swap the gears inside the transfer box to pair an auto and a manual transfer box so that i can get 2.643 low gear from AT-transfer and keep the 1.00 high ratio from the MT-transfer box? Tried googling this but maybe searching the wrong way, or maybe no-one has had to try this? Last edit: 06 Jan 2017 09:33 by yakuza. 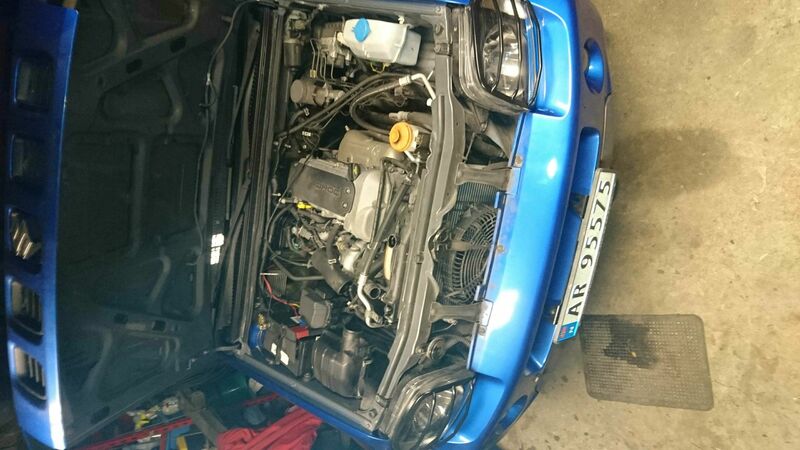 Or maybe swap to auto gearbox from another VVT? More costly of course and need to get the interoir details..
Edit: No, too costly.. forget it. Last edit: 06 Jan 2017 11:02 by yakuza. I'd say get the fat tyres on......but I can imagine how much the divorce would cost! Gearing job has been kind of put on hold for a while.. Think best option is to change to expensive after market gears for low gear only in my existing transfer box. I think i like the highway revs as they are now. VVT manual is not your best option if you like to modify and put bigger wheels i guess. - MOT tomorrow. I have to put on my old legal 195/80 tires as 235's will not pass. otherwise should be ok.
- Come easter i will change to M16. low milage engine allready in my garage being stripped for its Liana past. I think i've got all parts needed like rocker cover gasket, oil sump blue-silicone, oil filter stud..
Service parts and oil, and even a new clutch and an engine block heater element. Last edit: 15 Mar 2017 12:36 by yakuza. I thought it was a straightforward conversion....swap your bits over and fire it up. Think I got it mostly sorted out and well planned. It is a M16 from a '08 Liana going into my' 05 Jimny. Thats exactly the same swap ive just done (M13VVT to M16VVT), except my 1.6 engine came from a swift sport. Its pretty straigforward as Kiethy says, only problem i found was the water pump rear outlet wouldnt swap over, so i had to get a length of flexible rad hose to link the pump to the bottom of the rad. The 1.6 liana throttle body fitted straight onto the jimny inlet manifold also (no grinding needed).